China's first cargo spacecraft Tianzhou-1 has successfully released a tiny satellite while in orbit, CCTV reported. It is the first time that a Chinese cargo spacecraft has successfully discharged a satellite after storing it for a long time. The Tianzhou-1 was launched into space with the CubeSat on board on April 20 and released it Tuesday, 104 days later. Scientists have tested different kinds of discharge technology, such as the separation and unlocking and connectivity between the in-orbit launcher and the satellite. CubeSat is an experimental satellite weighing less than 1 metric ton. After flying with the Tiangong-2 space lab for about two months, Tianzhou-1 separated from the space lab and entered a stage of independent operation in June. Tianzhou-1 is orbiting about 390 kilometers above Earth, conducting a variety of experiments. The spacecraft will later carry out an automated fast-docking with Tiangong-2 and conduct the third refueling of the space lab. 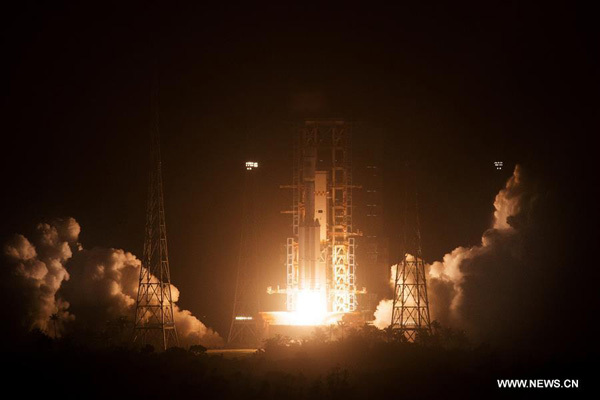 China's first cargo spacecraft Tianzhou-1 has successfully released a tiny satellite while in orbit.